Immigration is one of the big issues in the EU referendum debate, with a lot of claims about how harmful or beneficial it is to the UK. Some of this is based in fact. A lot of it is not. As someone who is (relatively) neutral on the EU referendum, though tending towards reluctantly voting Remain, and knows a little about the EU, I’m trying to provide some facts to help people looking for some unbiased information on the pros and cons of being in the EU. The EU does have a Freedom of Movement rule, but this rule only applies to “workers” and citizens of EU member states and their families. It does not apply to refugees or other migrants coming from outside the EU. The only exceptions would be the minority of asylum seekers who are granted not only refugee status, but full citizenship in an EU member country. Would leaving the EU end Freedom of Movement or not? Norway and Switzerland, who are not members of the EU, trade with the EU through their membership of the European Economic Area or EEA (basically a free trade zone without political integration of the kind most of the Leave campaign back). 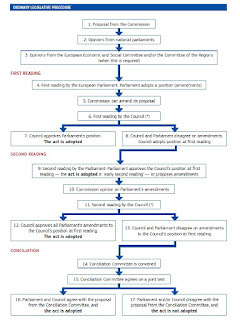 However EEA membership requirements include the same Freedom of Movement rules with the EU as EU membership does. It is possible that the UK, which is a considerably larger country and economy than Norway or Switzerland, might be able to negotiate a special deal that granted it single market access without freedom of movement, just as it negotiated opt outs from the Schengen agreement and from adopting the Euro as a currency as an EU member. It would however be one country of 64 million people negotiating with a bloc of 27 countries with 440 million odd people, so those could be tough negotiations. A migrant crisis in the EU? The scale of the “migrant crisis” in the EU, and how much it affects Britain, is also greatly exaggerated by much of the media. To see the full details, see the blog post on this link. In summary though, last year (2015) the total number of people coming to the EU from outside it was under 1% of its 504 million population spread between 28 countries. Many of the people who arrive each year leave or are deported. Only a small minority of these come to Britain. 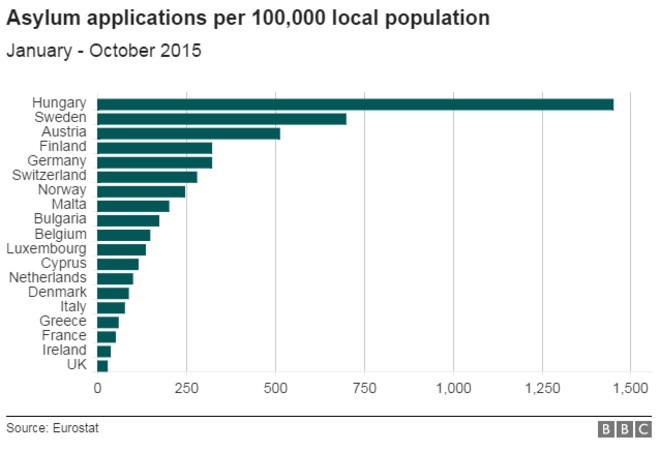 The UK gets a very small share of asylum applications relative to our population compared to other EU countries (2). There is a lot of talk of “open borders”. The EU does not have open borders with non-EU countries. Until last year some EU states – those that signed up to the Schengen agreement – did have open borders with one another. This has never included the UK or Ireland, which did not sign the agreement and have always required passports to be shown and customs checks for people entering or leaving the UK. Several countries, including Hungary, have broken the Schengen agreement last year during the “migrant crisis”, by closing their borders with other EU countries. Another factor to consider is that somewhere between 1.2 million and 2.2 million British people are living or working in other EU countries, mostly under EU Freedom of Movement rules. And some of them do claim benefits (though, like citizens of other EU states in the UK, some of these are in-work benefits). (3) – (5). If the UK did leave the EU, and did manage to get a special deal that meant Freedom of Movement rules didn’t apply, it seems massively unlikely that remaining EU member states would continue to allow British citizens Freedom of movement in their countries. 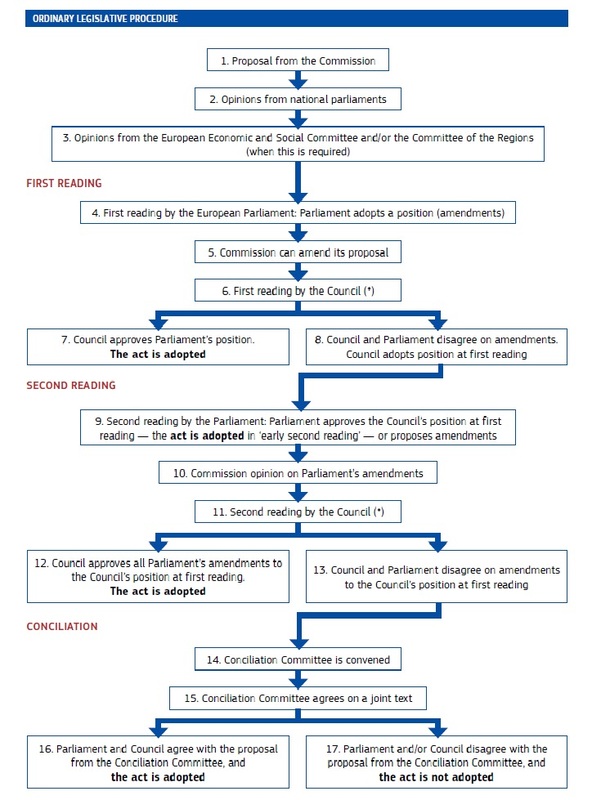 Some lawyers argue that under the 1969 Vienna Convention anyone who had lived in another EU country before the UK left the EU would retain “acquired rights” to stay there even after the UK left the Union (6). But other lawyers argue the opposite, saying the Vienna Convention applies only to bilateral agreements between two states, and not to relations between the EU and former EU member states (7). Either way UK citizens who wanted to go to live, work or claim benefits in other EU countries after the UK left the UK would have no legal right to do so. And if the UK expelled citizens of other EU countries, they would almost certainly retaliate in kind by expelling British citizens from their countries. Most of the estimated 3 million citizens of other EU countries living in the UK under the same rules are in work (8) – (9). Whether they would be able to stay in the UK if the UK left the EU would depend on the same factors are for UK citizens living in other EU countries outlined above. It would also depend on what policies the UK government decided on and what agreements it could make with the EU. What is certain is that if no deal was struck then most EU citizens currently in the EU would not meet the current UK government standards applied to non-EU nationals as required for a visa (10). 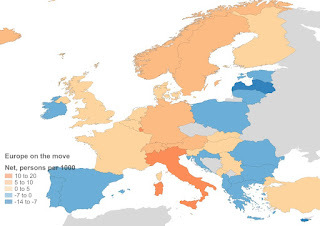 What percentage of immigrants to the UK are from the EU? The number of people coming from EU countries has increased a bit faster than those coming from non-EU countries since 1990 though, probably due to the new member countries that have joined since then. How does immigration from the EU benefit or harm the UK? The big area where EU membership does have an effect on immigration in the UK is immigration from other EU member states to the UK increasing our population. Is this harmful to the economy and existing population of the UK, beneficial, neither, or a mixture though? Does immigration increase unemployment and /or push down wages? It’s often claimed by anti-immigration campaigners that immigration is pushing down wages and increasing unemployment in the UK, as well as overloading public services like the NHS and schools with more people than they can handle. A London School of Economics study looking at wages, unemployment and levels of immigration in each of England’s counties between 2004 and 2012 found no connection between levels of immigration and unemployment or wages (12). Some other studies found a small increase in unemployment caused by immigration from the EU, especially during recessions, but overall found there has not been enough research to say for certain (13). The idea that immigration just causes unemployment and lower wages is based on missing out half the picture though. Yes immigration increases the supply of labour, but any population increase, whether due to immigration or not, also increases demand for goods and services from the same extra people, not only from the public sector but from private companies too. More people means more sales of products and services for lots of businesses, meaning more profits and more jobs. If that was not the case then every time a country’s population increased for any reason – whether immigration or more people being born than are dying, it would immediately get poorer. The UK’s population has been increasing for centuries – and it’s been getting richer all the time. So the overall effect on the unemployment rate and wages from any population increase should be roughly zero, all other factors being equal. The exception of course is that some migrant workers send or take much of the money they earn working in the UK back to their home countries, which would reduce the wealth of the UK and demand for goods and services here compared to if people born here or staying here permanently had that job. A rapid increase in population may well put strain on public services in some areas, especially as more immigrants settle or work in London and the South East, where most of the jobs are, and where they are more likely to be able to make contact with family members or friends who came before them. Citizens of other EU countries make up about 5% of NHS staff, about the same proportion of the UK’s population who are citizens of other EU countries, but they make up 10% of NHS doctors (14) – (15). Immigrants and the EU are easy to blame for national governments looking for someone to blame for the effects of their own policies. The NHS and schools have been under considerable strain for decades due to the “internal market” introduced under Thatcher, and the exorbitant cost of Private Finance Initiatives or PFIs brought in under Major’s Conservative government in the 1990s, expanded under both New Labour (who renamed them ‘Public Private Partnerships’ or PPPs) and then by the Conservatives again (renamed ‘PF2s’) under Cameron and Osborne. It’s often argued that immigration is the cause of the shortage of housing and high rents and rising house prices in the UK. How true is this though? Most studies show 60% or more of immigrants in the UK rent privately owned properties, and that immigrants are more likely to rent houses from private landlords than people born here (16) – (17). Studies also show that house prices actually fall in areas where immigrants live, as less people who aren’t immigrants want to live there (18). While about 12.5% of the UK’s population were born in another country, figures from pretty much every neutral source show about the same percentage of immigrants as people born here are in social housing. So the common claim that immigrants get to “jump the queue” for social housing is false (19) – (21). The shortage of social or council housing is largely caused by governments from Heath’s on selling off council houses at a discount price in order to get votes, without providing local councils with anything like enough money to build or buy replacements for most of them. This, along with a fall in the percentage of new houses that are publicly owned, has depleted the UK’s stock of social housing massively. There are also over 1 million privately owned properties which no one lives in. So inequality is probably another cause (22). The rate of population increase (mostly driven by increasing immigration in the last few decades) can’t be ignored as a factor, but it’s far from the only one – and not as high as many people believe. The net increase in population of 336,000 last year for instance was an increase of just over half of one per cent on the existing population of 64 million (23). The one area where immigration might be more harmful is that any population increase when population is already high can lead to damage to the environment and to peoples’ quality of life by more of the country becoming urbanised as more trees are cut down, more fields built over with houses, more roads are built, more cars are driven etc. 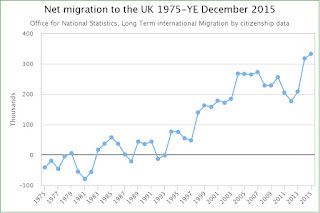 Immigration is certainly the main cause of population increase in the UK and most other developed countries, with birth rates among people born here lower than those among immigrants. The net increase in population last year was around 336,000, added to an existing population of 64 million, an increase of slightly over half of one per cent (24). 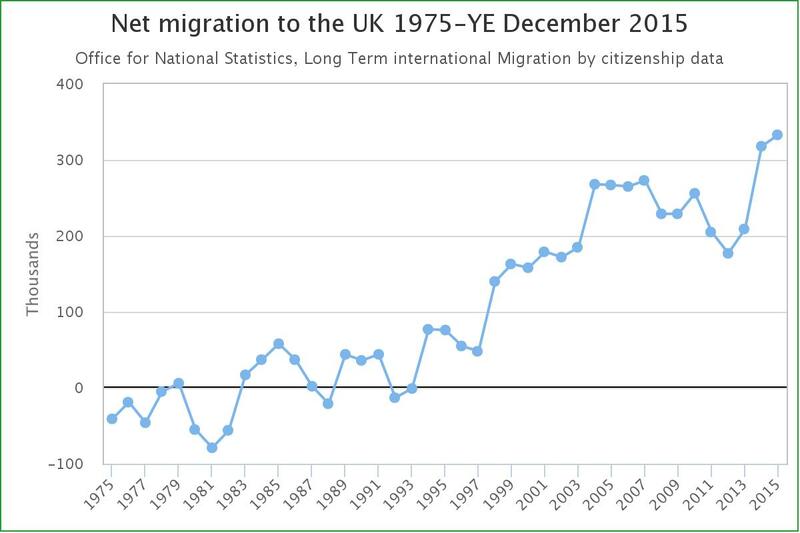 It’s also certainly true that the long term trend of immigration since the UK joined the EC and then EU has been to keep increasing, especially since the 1992 Maastricht Treaty which established Freedom of Movement within the EU, though even before we joined the EU the trend was to increase (25). It seems likely that that trend will continue. I would argue that the damage population increase can do to the environment and quality of life is the one area that EU membership and Freedom of Movement could be harmful overall to the UK. But this has to be balanced against the way that immigration from the poorest countries can help the poorest people in the EU, and their families. Money sent home by migrant workers dwarfs all foreign aid combined. This , of course, means some of the money earned by immigrants in the UK is not spent here, so does not increase demand for goods or services here. The people who are migrant workers sending money home though, are also the ones who go home after earning some money, so those people don’t increase the UK’s population in the long term. Plus the UK, like all developed countries has problems caused by an increasing average age. The proportion of pensioners, who require both pensions and more health care, is rising. The proportion of people of working age is falling. 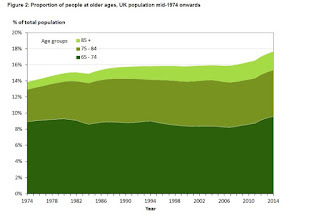 If we reduce the number of immigrants the proportion of pensioners may increase faster as the average age of immigrants and refugees is lower, most of them being of working age (26) – (27). There are other possible ways to counteract this – for instance in France the 35-hour week and benefit incentives for having two or more children have given it a higher than average birth rate of 2 per woman (28). But then population increase of any kind – whether due to people born here having children, or due to immigration, is just as harmful to the environment and quality of life. So there are benefits and costs to either increasing or reducing population, though at some point we have to face up to the need to reduce the entire world’s population and the amount of pollution created per person. 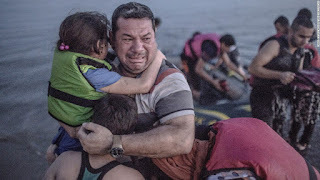 The biggest scandal (in my opinion) surrounding people coming from outside the EU to all countries in the EU is that the EU and its member governments (including the UK) are sending so many refugees back to countries which are clearly not safe, like Turkey, which has been sending Syrian refugees back to the civil war in Syria for years and is not really even a democracy any more (the President has stripped opposition MPs of their immunity from prosecution in preparation for jailing some of them). On top of that the Turkish government has restarted a civil war inside Turkey with its own Kurdish minority, and the UN has had to cut off food aid to many refugees in Turkey, Lebanon and Jordan as governments in the EU and other wealthy countries haven’t donated enough money to fund it.